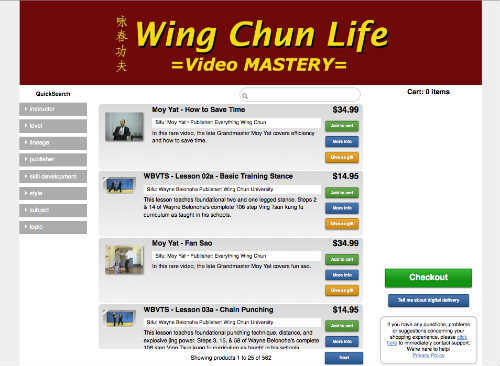 The WingChunLife.com Video Mastery section of the website enables you to download the world's most popular Wing Chun DVDs, from the world's most well-known and respected grandmasters, sifus, and lineages. There are three (3) parts to Video MASTERY. 1) PUBLISHERS (i.e. Wing Chun University, Sifu Sergio, etc.) - who produce and publish all these great Wing Chun videos. 3) YOU - the customer who directly benefits from this venture! Once you arrive on the Video MASTERY shopping site click around and get comfortable. There's a handy search bar to help you find what you want quickly. And the left-side navigation lets you pick and click categories. If you have questions about which videos to buy, ask me. I haven't watched them all (with over 561 titles I don't when I will). But I'll help as best I can. If you have TECHNICAL questions about downloading, using the Purple:Player/MOD Player, watching your videos, your account, purchases, etc... ask the guys at Purple. They're the big business that provides and supports all the technical magic. Or if you have more questions about the Purple guys you can read below. Purple is a new, open format for video products. Instant delivery Browse, search, preview and start enjoying within seconds after purchase. Instant access Watch on your tablet, smart TV, laptop or smartphone, online or offline. Safe Unlike discs that can get damaged or lost, you’ll never lose a Purple purchase. Eco friendly 1.6 billion discs go into landfills every year. Go green with Purple. Video streaming is awesome when it works. But if you want a perfect playback experience, anytime, anywhere, online or offline, then get your free app by clicking on your device below, and download your videos! Or watch instantly. CloudPlayer is like a “virtual shelf in the cloud” for your entire media library. We’re here for you! We’d also love to hear comments and suggestions on making the purple experience better! Full chapter menu, fast forward and rewind, slow motion backwards and forwards.